When you hear the name Dave Ramsey, you typically think of someone who provides sound advice and gives recommendations on setting your financial future in the right direction. Did you know that Tom Wiecek is YOUR Dave Ramsey Endorsed Local Provider for personal insurance in the Triad? 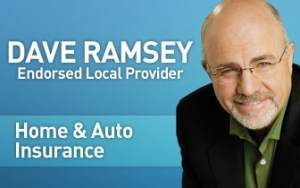 Dave Ramsey understands how difficult it may be to find the right kind of insurance advice, affordable rates, and customer service excellence, so he has set up this wonderful program called ELP that offers sound advice (Dave Recommends) to get you on your way to the best quality of coverage you can find. Working with a Dave Ramsey Endorsed Local Provider (ELP) means YOU come first! Being an ELP requires a lot of diligent work because of the higher level of excellence Dave demands. That’s why we are proud to say that Tom Wiecek, at Paramount Insurance Agency, is YOUR Dave Ramsey Endorsed Local Provider (ELP) for Personal Insurance in the North Carolina Triad Area. This means he is reliable, ethical, and trustworthy, while providing top-notch service ALL THE WAY to you. Use a local independent agent- The benefit of using an independent insurance agent is they work for YOU, and NOT the insurance company. Independent agents can shop your coverages from many of the top insurance companies to provide the right coverage for the best price. Who doesn’t want to save time? Combine all your policies with one independent insurance agency- This may save you up to 20% or more when you bundle all your coverages under one big policy. Carry at least a $1 million dollar umbrella- An umbrella insurance policy provides additional protection ABOVE the liability limits that you have on your current insurance policies, and is designed to protect you from serious claims and lawsuits. Increase deductibles- By increasing your deductibles, you can reduce your premiums to allow you to invest in higher liability limits. Tom Wiecek, at Paramount Insurance Agency, will work for you, to deliver what he promises, by providing the quality of insurance coverage you need. Contact independent agent, Tom Wiecek, TODAY at 866-869-3335 so that he can serve you as YOUR Dave Ramsey’s Endorsed Local Provider for your insurance needs in High Point, Winston Salem, Greensboro, and Burlington.